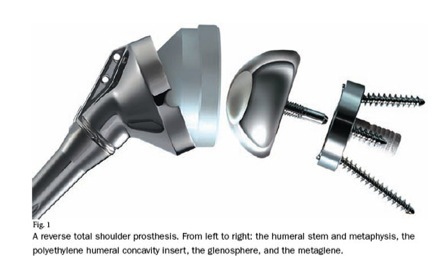 The glenohumeral joint is a ball and socket joint consisting of the humeral head (ball) and the glenoid fossa (socket). The primary movers of the joint are the rotator cuff (supraspinatous, infraspinatous, subscapularis, and teres minor), teres major, deltoid, biceps brachii and triceps brachii, latissimus dorsi and pectoralis major and minor. Stability of the joint is provided by both active and passive supports. 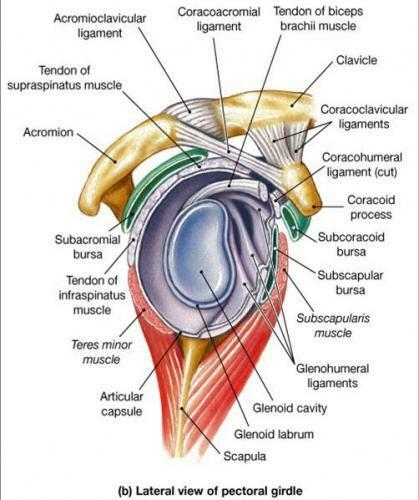 Active supports of the glenohumeral joint are the rotator cuff muscles. The joint capsule, ligaments, and the labrum provide passive support. Ligamentous support is provided mainly by the superior glenohumeral, middle glenohumeral, and inferior glenohumeral ligaments. 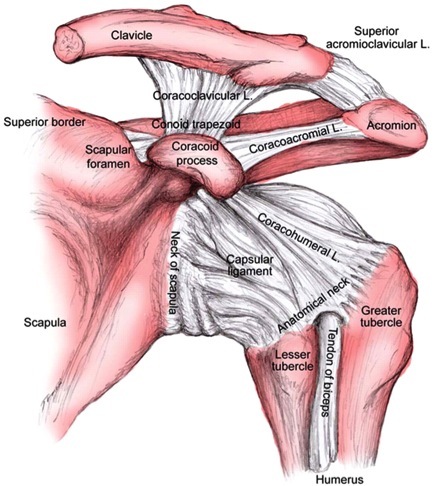 The anterior and posterior bands of the coracohumeral ligament also provide passive stability of this joint.2 The labrum acts to deepen the socket of the glenoid fossa, increasing passive support. - Permanent loss of rotator cuff tendons and arthritic changes in the glenohumeral joint. 3. Polyethylene Cup: This becomes the socket of the new ball and socket joint. It is made of polyethylene and is attached to the epiphysis proximally. 1. Metaglene: Specially coated metal plate that is attached to the glenoid fossa with screws. 2. Glenosphere: A half globe metal piece that is attached to the metaglene. 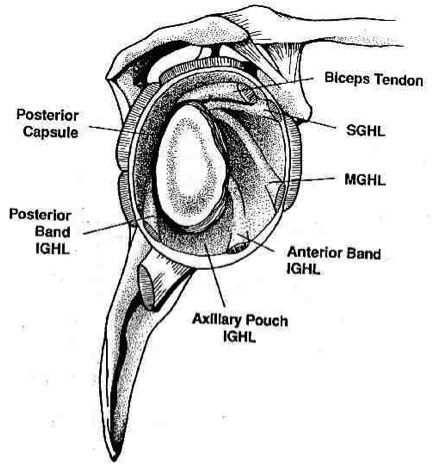 The glenosphere becomes the ball part of the new glenohumeral joint. *This is an example of one surgical approach to the reverse total shoulder arthroplasty. Surgeons may differ in their surgical protocols. An incision will be made to suit the surgical needs of the patient. Often, a deltopectoral approach is used for this procedure. The incision is superior and medial to the coracoid process, and extends to the deltoid tuberosity on the humerus. However, a transacromial or a superolateral approach may also be used.15 The deltoid muscle is freed from any adhesions to the surrounding tissue and is moved via blunt dissection to allow access to the glenohumeral joint. The axillary nerve is found and spared. The insertion of the subscapularis tendon is removed from the lesser tubercle of the humerus while keeping the origin intact. The humerus is then externally rotated to dislocate the humerus from the glenoid fossa. The humeral head is cut and removed. The medullary canal is reamed to the appropriate length for insertion of the diaphysis (lower humeral stem) to be placed. The proximal humerus is then contoured to the desired shape. The humerus is then moved to allow access to the glenoid fossa. The labrum is removed and the capsule is released. A central drill hole is prepared. The glenoid fossa is reamed, the drill hole is enlarged, and the base plate is screwed into the fossa. The glenosphere is screwed into the base plate and the glenoid portion of the replacement is complete. Surgery video: Union Memorial Hospital. - A problem is an intra-operative or post-operative event that is not likely to affect the patient’s final outcome. Problems include hematomas, radiographic scapular notching, and intraoperative dislocation. - A complication is defined as any intra-operative or post-operative event that is likely to have a negative outcome on patient recovery. Complications include instability, infection, dislocation, nerve palsies, loosening of components or fractures. With these definitions in mind, Zumstein15 reported a problem rate of 44%, a complication rate of 24%, re-operation rate of 3.5% and a revision rate of 10%. A very common problem is scapular notching. This notching is due to biomechanical changes of the joint, and subsequent impingement of the humeral component against the neck of the scapula when the arm is adducted. However, scapular notching is rarely clinically significant. Zumstein15 reports that the populations showing the majority of complications include patients with rheumatoid arthritis and patients who are having a revision surgery. The most common complication has been reported to be instability post-operatively. This instability can potentially be attributed to loss of muscular attachments, particularly when the subscapularis is completely released. Ligament disruption and decreased tension of the deltoid may also contribute to instability post-operatively. Early dislocation risk with internal rotation, adduction, and extension. 1. Passive range of motion, forward flexion and elevation in scapular plane to 90 degrees. 2. External rotation to available range of motion. 5. Periscapular sub-max pain free isometrics. 4. Scapulothoracic mobilization (grade 1&2). 1. Continued progression into functional and recreational activities. 1. Sanchez-Sotelo, J. (2009), Reverse total shoulder arthroplasty. Clinical Anatomy, 22: 172–182. 2. Edelson JG, Taitz C, Grishkan A. 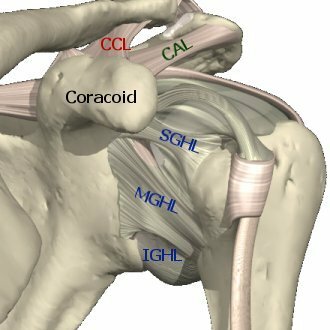 The coracohumeral ligament. anatomy of a substantial but neglected structure. J Bone Joint Surg Br. 1991;73(1):150-153. 4. Drake GN, O'Connor DP, Edwards TB. Indications for reverse total shoulder arthroplasty in rotator cuff disease. Clin Orthop Relat Res. 2010;468(6):1526-1533. doi: 10.1007/s11999-009-1188-9. 7. Walker M, Brooks J, Willis M, Frankle M. How reverse shoulder arthroplasty works. Clin Orthop Relat Res. 8. American Academy of Orthopaedic Surgeons. Rotator cuff tears. American Academy of Orthopaedic Surgeons. http://orthoinfo.aaos.org/topic.cfm?topic=a00064. Accessed November 20, 2011. 9. Warme, WJ, Matson FJ. Minimize Cuff tear arthropathy - CTA - prosthesis for shoulder arthritis: Surgery with a cementless CTA prosthesis can lessen pain and improve function in shoulders with the combination of arthritis and rotator cuff tears. University of Washington Orthopaedics and Sport Medicine. December 23, 2009. Accessed November 18, 2011. 12. University of Washington Orthopaedics and Sport Medicine. Types of glenohumeral instability. University of Washington Orthopaedics and Sport Medicine. http://www.orthop.washington.edu/PatientCare/OurServices/ShoulderElbow/Articles/TypesofGlenohumeralInstability.aspx. February 10, 2005. Accessed November 12, 2011. 13. University of Maryland Orthopaedics: Shoulder and Elbow Program. Reverse shoulder replacement surgery. University of Maryland Medical Center. http://www.umm.edu/orthopaedic/rsr.htm. September 20, 2010. Accessed November 15, 2011. 14. Lenarz CJ, Gobezie R. Reverse total shoulder arthroplasty. J Vis Exp. 2011 (53). 15. Zumstein MA, Pinedo M, Old J, Boileau P. Problems, complications, reoperations, and revisions in reverse total shoulder arthroplasty: A systematic review. J Shoulder Elbow Surg. 2011;20(1):146-157. 16. Boudreau S, Boudreau E, Canoa D, Higgins L, Wilcox WB. Reverse total shoulder arthroplasty protocol. Brigham and Women's Hospital. http://www.brighamandwomens.org/Patients_Visitors/pcs/RehabilitationServices/Physical%20Therapy%20Standards%20of%20Care%20and%20Protocols/Shoulder_Reverse_TSA_protocol.pdf. 2011. Accessed November 20, 2011.